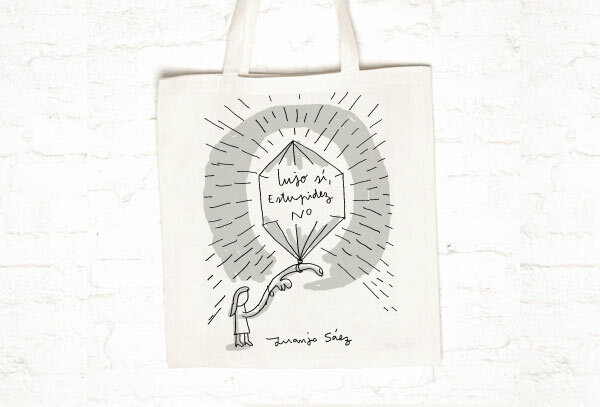 Juanjo Sáez has designed a tote bag exclusively for Passeigdegràcia.com fans. Do you want one? Help us spread the word on our project by buying the first bag in our collection. Say it loud and say it clear: Lujo sí, estupidez NO [Yes to luxury, no to stupidity]. Made out of pure cotton without chlorine nor chemical treatments. Made with reinforced seams. Size: 380 mm x 420 mm (15″ by 16.5″). Screen printing using evironmentally-fiendy ink. Both print and material can be washed numerous times.